Most people consider themselves middle class, yet live paycheck to paycheck. In some parts of the country, even a six-figure income is not enough. Sharon Winick, 49, and her husband Michael consider themselves middle class. They have three children and own a home in Chevy Chase, Maryland, where Michael is a network administrator. Sharon is a paralegal turned stay-at-home mom. Between his work, her occasional side jobs and their investments, they bring in roughly $125,000 a year. Yet they struggle to make ends meet. With the children all now approaching college age, tuition is a big concern. "I don't know how we are going to do it without borrowing from the house." About 70 percent of the U.S. adult population consider themselves middle class, both in income and mindset, according to recent findings in Northwestern Mutual's 2017 Planning and Progress study. That's roughly the same as five years ago, Northwestern Mutual said. 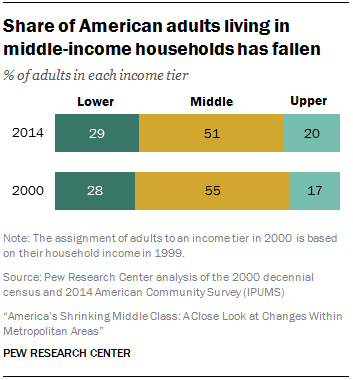 However, the actual number of middle-income households in the United States has been shrinking for decades, and made up only half of the population in 2015, down from 61 percent in 1971 according to the Pew Research Center. Over that period, both the share of upper-income households and lower-income households grew. Still, slightly more than half of those who considered themselves middle class had household incomes ranging from $50,000 to $125,000 a year, according to Northwestern Mutual, in line with Pew's parameters — adults whose annual income is two-thirds to double the national median, about $42,000 to $126,000 annually for a household of three. The rest of those who said they are middle class — but aren't — fall either above or below that benchmark, Northwestern Mutual said. "Often there's a disconnect with the amount of money they have and how they consider themselves," said Emily Holbrook, the director of planning at Northwestern Mutual. It comes down to their income, expenses, savings and where they are located, she said. In some parts of the country, particularly where the Winicks live, a six-figure income is not even enough to get by. "This just shows that if you are earning six figures and you feel like you are struggling, it's not like you are crazy," said Mandi Woodruff, MagnifyMoney's executive editor. "Fixed expenses are increasing at a faster rate than incomes, making it harder to live the lifestyle our parents lived." "The number one issue we get is 'I feel like I am making a lot of money but I don't know where it all goes,'" said Ted Jenkin, a certified financial planner at Atlanta-based oXYGen Financial. Jenkin recommends a 21-day budget cleanse, which involves going through each bill and finding ways to cut it back, then reallocating that cash toward specific financial goals, including retirement and college tuition.